This entry was posted in community news and tagged events MTTS MTTS 2016 on December 24, 2015 by James Day. MINI USA today announced the official route for MINI TAKES THE STATES 2016. The updated MINI TAKES THE STATES event website also shows the MTTS 2016 logo for the first time, which incorporates MINI’s new branding. Woodcliff Lake, NJ – December 24 – After much anticipation, MINI USA today announced the official route for the 2016 running of MINI TAKES THE STATES . The legendary biennial cross-country owners rally will kick off at Road Atlanta in northeast Georgia on July 9, 2016 and finish at the Thermal Club in Palm Springs, CA, on July 23, 2016. In true MINI TAKES THE STATES fashion, the route will not take a direct path from point A to point B. The more than 4,000-mile “track-to-track” adventure will travel up the east coast, across the Great Plains and over the Rocky Mountains before arriving in Southern California. The legendary adventure, which attracts thousands of MINI owners and enthusiasts every other year, will pay tribute to the brand’s motorsports heritage by stopping at several professional race tracks to host driving experiences along the way. MINI TAKES THE STATES 2016 will leave Atlanta making stops in Charlotte, NC, Richmond, VA, and Baltimore, MD. The route then turns slightly west heading towards stops in Pittsburgh, PA, and Detroit, MI. The group of owners and MINI employees will then head north and cross over the legendary Mackinac Bridge, considered to be a rite of passage for thousands of MINI owners who have participated in the biennial MINI on the Mack event before arriving in St. Ignace, MI. After crossing over into Michigan’s Upper Peninsula the route heads along the banks of Lake Michigan to Green Bay, WI, before heading west for stops in Minneapolis, MN, and Sioux Falls, SD. The rallying MINI owners will then motor across the Great Plains and through the Black Hills where they’ll make a pit stop in Sturgis, SD, home of the legendary motorcycle rally. 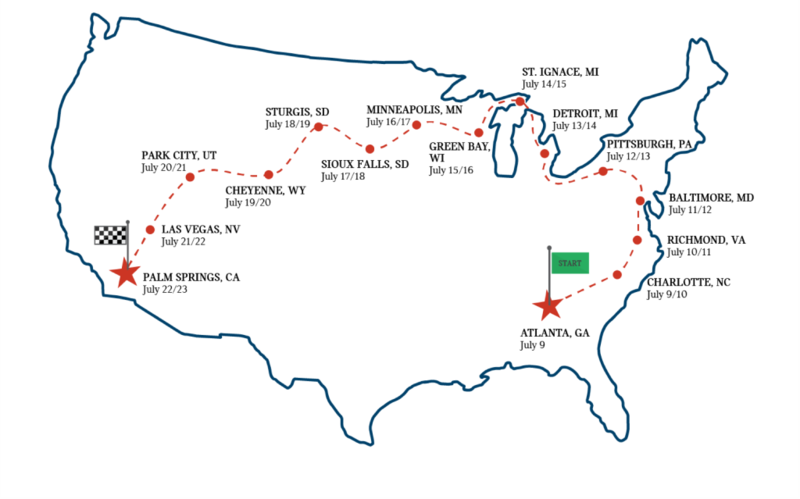 The route then heads south for the final legs of the epic journey making stops in Cheyenne, WY, Park City, UT, and Las Vegas, NV, before finally crossing the finish line in Palm Springs, CA. Stay tuned for more updates or visit MINITAKESTHESTATES.com to receive email updates. For blog posts and press images from MINI TAKES THE STATES 2014 please visit the MTTS 2014 page on MINIUSANEWS.com. Media interested in updates on MINI USA can also follow us on Twitter at @MINIUSANEWS. This entry was posted in news and tagged MTTS MTTS 2016 on July 9, 2015 by James Day. 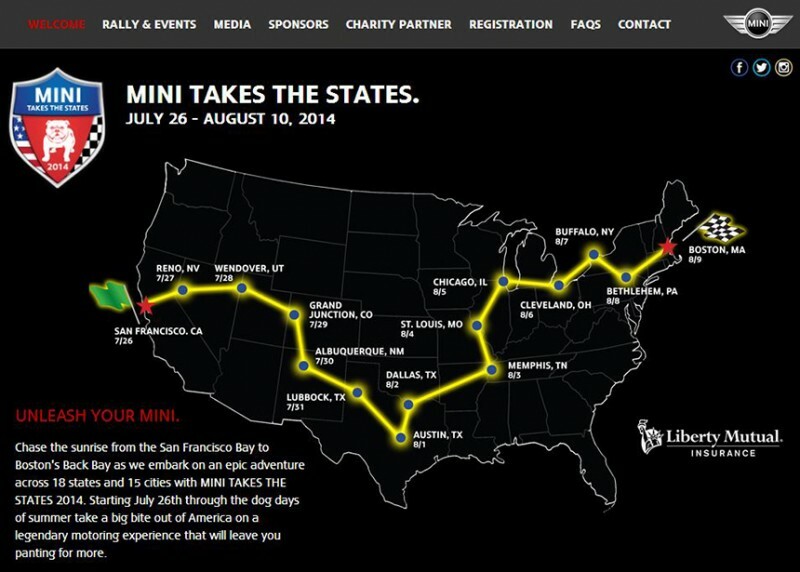 Today MINI USA released the dates for MINI TAKES THE STATES 2016. Set to begin one year from today, the biennial event will take place from July 9 to 23, 2016. Woodcliff Lake, NJ –July 9 2015…It’s one year away but start planning now! MINI USA today officially announced the dates for the popular cross-country owners’ rally, MINI TAKES THE STATES (MTTS). MTTS 2016 will kick off on Saturday, July 9, 2016, and finish on Saturday, July 23, 2016. The route will be announced at a later date. In 2014, MINI owners and MINI USA team members motored into Boston’s Back Bay after completing a 5,142-mile journey from San Francisco that covered 15 cities and 18 states in 14 days. A portion of that year’s event registration fees were donated to Best Friends Animal Society, the charity partner for the rally. A charity partner for the 2016 event will be announced at a later date. MTTS 2014 attracted close to 4,000 MINI owners from around the world, including two men who drove their MINI from Germany as part of a quest to drive around the world. Nothing about MTTS 2014 was small; in fact, close to 500 MINI owners and staff went “all the way” from coast-to-coast. Others joined in for just a few days of fun, with each of the day’s events averaging more than 900 participants. MTTS will make the now legendary cross-country trip for the sixth time in 2016, with thousands of MINI owners and enthusiasts expected to join the rally, or a leg of it. Along the way, MINI USA will provide its loyal owners and enthusiasts with genuine, once-in-a-lifetime motoring experiences. Stay tuned for more updates or visit MINITAKESTHESTATES.com. For blog posts and press images from MINI TAKES THE STATES 2014 please visit the MTTS 2014 page on MINIUSANEWS.com. Can’t wait until 2016? Join MINI owners from all over the country in Mackinaw City, MI, August 1, for a second attempt at the world record for the largest parade of MINI vehicles. The current record is 1,450 MINIs set by the London & Surrey MINI Owners Club on May 17, 2009. Help us bring the record to the United States as we cross one of America’s longest suspension bridges, the Mackinac Bridge. Join the fun by registering today at MINIONTHEMACK.com. This entry was posted in news and tagged MTTS MTTS 2014 on July 26, 2014 by James Day. MINI USA’s epic roadtrip MINI TAKES THE STATES starts tonight with a MTTS Launch Party in San Francisco. Here are all of the official places to follow the event. MINI TAKES THE STATES – Official website with Registration, Rally & Events, FAQs, and more. MINI TAKES THE STATES 2014 – Official Tumbler website where you can share your photos, videos, and stories. Facebook – #MTTS2014 and MINI USA. Twitter – @MINIUSA and #MTTS2014. This entry was posted in news and tagged apps MTTS MTTS 2014 on July 20, 2014 by James Day. 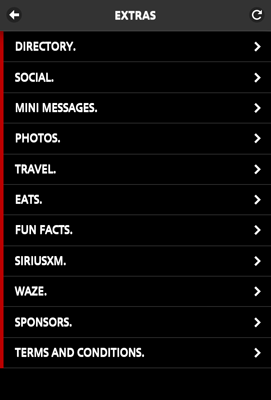 The MINI TAKES THE STATES 2014 app is now available for Android and Apple devices! 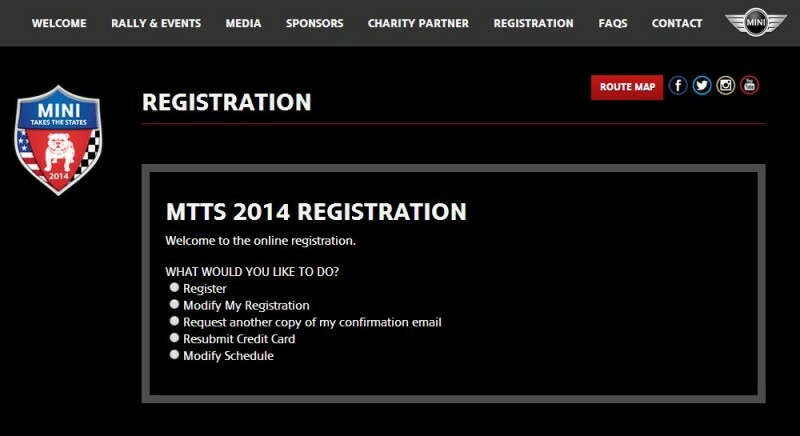 The MTTS 2014 app requires a login using your registration email and code (printed on your event ticket). Once logged in, you get options for the the daily Agenda, Route, self Check-in, Games, and Extras. You can quickly update the content with a link on the main screen (see above). There are two games: a Trivia Contest and Photo of the Day. Answer questions and submit photos to earn points. The app displays the Leaderboards. There are a lot of Extras. Set up your Profile, view your registration conformation, get links to submit to social media, photo gallery, recommended hotels, apps, suggested places to eat, fun facts, Sirius XM playlists, Waze information, sponsors, and more. 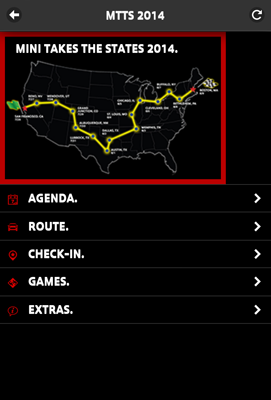 Download the MTTS 2014 app from Google Play. Download the MTTS 2014 app from Apple iTunes. 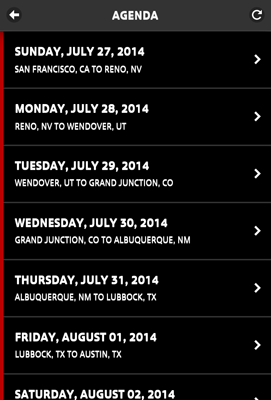 Download the MTTS 2014 app for Windows Phone. This entry was posted in news and tagged MTTS MTTS 2014 on March 27, 2014 by James Day. The wait is over. As promised, Registration opened today for MINI TAKES THE STATES 2014. This entry was posted in community news and tagged MTTS MTTS2014 on February 6, 2014 by James Day. MINI USA today update the MINI Takes the States 2014 website with rally and event information, media, sponsors, charity partner (Best Friends Animal Society), and FAQs. 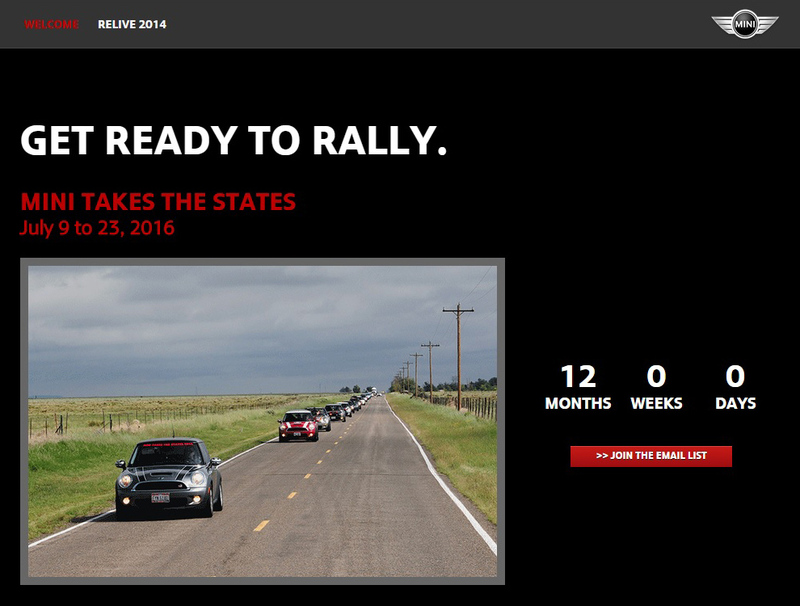 According to the website, MTTS 2014 Registration opens March 27, 2014. This entry was posted in news and tagged MTTS MTTS 2014 on July 26, 2013 by James Day. 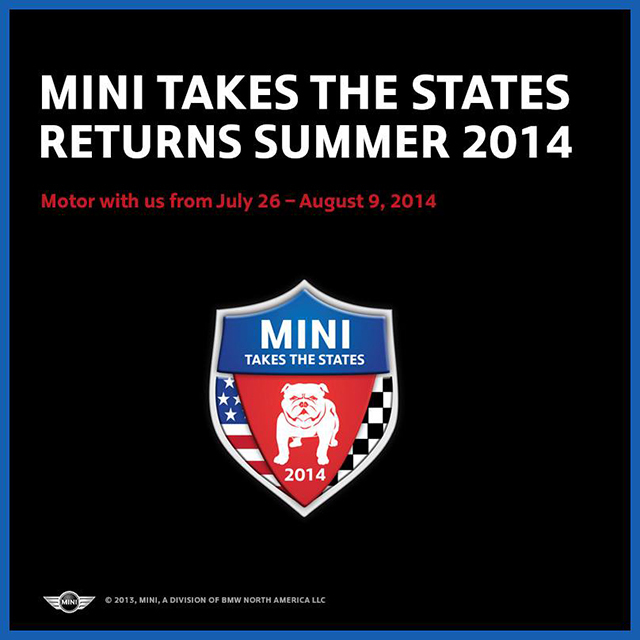 MINI USA this morning announced MINI Takes the States 2014 which will take place from July 26 – August 9, 2014. This entry was posted in news and tagged MTTS MTTS 2012 on August 17, 2012 by James Day. If you attended MINI Takes the States 2012, you probably collected several button pins from the cities or sponsors on the route. Now MINI USA, via Facebook, is offering virtual badges in partnership with Basno. Whether you joined us for one city or went all the way, we know one thing is for sure: you scanned your badge and you collected your pins. Now that your lanyards are tucked away or are proudly on display for loved ones to see, we want you to show the rest of the world what you accomplished. We have three virtual badges that you can collect and share via e-mail and on your social networks. Please have your badge number and/or email address handy to identify whether you were an ATTENDEE, went COAST TO COAST or attended a MINIcross event. You can collect your virtual badges here. Get the MINI Takes the States 2012 ATTENDEE badge. Get the MINI Takes the States 2012 COAST TO COAST badge. Get the MINI Takes the States 2012 MINIcross badge. This entry was posted in news and tagged MTTS MTTS 2012 on July 18, 2012 by James Day. MINI Takes the States 2012 has finished. It was another epic cross-country road rally led by MINI USA and “Chief Motorer” Jim McDowell. Those who attended will have memories, and maybe some new friends, for a lifetime. To relive your adventures or to see what you missed out on, visit our extensive lists of photo galleries, videos, blog posts, tweets, and articles. MINI TAKES THE STATES 2012 website. MINI USA NEWS 2012 MINI Takes the States blog. MINI Space article MINI Takes The States: The Convoy Rolls On. MINI Takes the States Facebook event page. Google+ #MTTS2012 – Hashtag for all MTTS 2012 posts. Twitter #MTTS2012 – Hashtag for all MTTS 2012 tweets. Automobile magazine report 2011 Mini Cooper S Countryman All4 – Mini Takes The States 2012. Motor Trend report Mini Takes the States from New York to Los Angeles. This entry was posted in collectibles and tagged MTTS MTTS 2012 on July 15, 2012 by James Day. Major MINI events are always a great source of MINI items for collectors. MINI Takes the States 2012 was no exception. Like previous MINI Takes the States events, MINI USA distributed button pins for each host city, events like MINIcross, and sponsors. Once again there was a special Bulldog button pin only available from “Chief Motorer” Jim McDowell (obtained by giving him the secret handshake). MINI USA sold several items such as MTTS 2012 shirts and coffee tumblers. Collectible items included MTTS 2012 metal grille badges ($20), lapel pins ($3), and keychains ($3). MINI Financial Services handed out free temporary tattoos, as well.